Why has Dave Eggers gone out of his way to bury his original review of INFINITE JEST in a calculated revisionist haze? And what does it reveal about Eggers’s truly unadventurous and coldly vanilla nature? Besides frequently losing itself in superfluous and wildly tangential flights of lexical diarrhea, the book suffers under the sheer burden of its incredible length. And he has succeeded in burying his original Infinite Jest review, quite possibly the apotheosis of his risk-averse and coldly vanilla taste. It was originally sussed out in 2006 by the vivacious contributors to the Wallace-l mailing list and further reviewed by the dearly lamented litblog Rake’s Progress. It has not been available in full online. Until now. It’s post-millennial America, sometime after the Jack Kemp/Rush Limbaugh presidential administration. Giant deformed babies and herds of feral hamsters roam the blasted landscape of the Great Concavity, a gigantic toxic waste receptacle that covers much of what used to be Maine, New Hampshire, and upstate New York. Relations between the United States and Canada are strained (due to the northerly directed fallout from the Concavity), and a bizarre cadre of wheelchair-bound Quebecer insurgents is planning a massive terrorist attack on the entertainment-lulled and drug-addled U.S. populace. Such is the provocative backdrop of David Foster Wallace’s brilliant, fat, and frustrating second novel, “Infinite Jest.” Science fiction it’s not. Though set against an epic landscape of environmental toxicity and corporate insinuation, at its core the book is an intimate and bleak portrait of the human fallout caused by a weak-willed country interested only in pleasing itself. Exploring the lives of those enslaved by TV, drugs, alcohol and emotional dependence, Wallace paints a picture, one character at a time, of the decline of a culture paralyzed by its need for escape and its willingness to die in the pursuit of happiness. Like his earlier novel, “The Broom of the System,” “Infinite Jest” revolves around a peculiar and brilliant family. The Incandenzas are proprietors of the posh Enfield Tennis Academy, a combination athlete factory and elite academic high school. Jim Incandenza, the eccentric and hard-drinking Academy founder and family patriarch, has, after failing in his attempt to make it as a filmmaker, recently killed himself by sticking his head in a microwave. His three sons — Orin, a celebrated punter for a pro football team; Mario, who has a birth defect and a heart of gold; and Hal, a linguistic genius and nationally ranked junior tennis player — struggle to come to grips with the void and legacy left by their father. But the family is coming apart at the seams. Avril, Jim’s widow, is seeing a 17-year-old. Orin has an uncontrollable habit of seducing and abandoning married woman. Hal, listless and increasingly withdrawn, is hooked on high-resign marijuana. But the Incandenzas are the most normal in Wallace’s parade of physically and psychologically crippled characters. Down the hill from the Academy is Ennet House, a halfway house for recovering addicts. There resides a menagerie of people trying to start over: Don Gately, an ex-con who started drinking vodka at age 10 and is struggling through Alcoholics Anonymous; Joelle van Dyne, who starred in many of Jim Incandenza’s obscure films and who recently attempt to freebase herself to death; and Randy Lenz, a cocaine abuser who likes to set cats on fire. In stunning and brutal detail, Wallace shows how these characters attempt to soothe, through one substance or another, the wounds of their horrible childhoods. Meanwhile, the Canadian terrorists, in their plans to bring the United States to its knees, are attempting to track down a mysterious and lethal video cartridge so entertaining that it’s rumored to render audiences forever catatonic. Its origin is eventually traced to Jim Incandenza, and all those close to him become subjects of investigation and pursuit. As the many story lines merge, the rebels get closer to what they hope will become the cinematic equivalent of the neutron bomb. But the book is more about David Foster Wallace than anything else. It’s an extravagantly self-indulgent novel, and, page by page, it’s often difficult to navigate. Sentences run as long as 800 words. Paragraph breaks are rare. Aside from being incredibly verbose, Wallace has an exhausting penchant for jargon, nicknames and obscure references, particularly about things highly technical, medical or drug-related. When people talk, they “interface.” When they think hard, they “wrack their RAM.” Things like tennis matches and math problems are described in excruciating detail. He has a fussy way with his adjectives and adverbs, while some — such as “ghastly,” which is used much too often — have that disingenuous feel that renders the narrative around them impotent. Besides frequently losing itself in superfluous and wildly tangential flights of lexical diarrhea, the book suffers under the sheer burden of its incredibly length. (That includes the 96 pages of only sporadically worthwhile endnotes, including one that clocks in at 17 pages.) At almost 1,100 pages, it feels more like 3,000. Still, if you can come to terms with his dense and labored style, the rewards are often tremendous. There’s no doubt that Wallace’s talent is immense and his imagination limitless. When he backs off and gives his narrative some breathing room, he emerges as a consistently innovative, sensitive and intelligent writer. In particular, while inhabiting the tortured, drowning minds of the addicts, he is devastating. Too often, however, “Infinite Jest” buckles under the weight of its own excess. Of course, it seems as if that’s the sort of criticism Wallace expected. There’s a lot of the author in the frustrated film maker Jim Incandenza, who in his work had very little interest in telling a story, opting to experiment with handmade lenses and innovative lighting effect. Jim scorned pedestrian narratives and parodied established genres; he held his audiences in almost utter contempt, refusing to pander to their need for easily palatable entertainment. Finally he succumbed, making what he considered the perfect entertainment. Then he killed himself. “Infinite Jest” also ends abruptly, leaving as many questions unanswered as does Jim’s suicide. Like his alter ego’s experimental films, the book seems like an exercise in what one gifted artist can produce without the hindrance of an editor. Subsequently, it’s also an exercise in whether or not such a work can sustain a reader’s interest for more than 1,000 pages and thus find an audience outside academia. Wallace’s take on that can be found in the book’s apt title: It’s an endless joke on somebody. David Eggers is an editor of Might Magazine in San Francisco. ← Previous Post What Will Become of Uninformed Muttonheads Who Promulgate Misinformation on Slate About Public Libraries? I’ve not read Eggers’s 2006 re-assessment of INFINITE JEST. Any way you could post that, so we can compare the critiques? Does Egger acknowledge the earlier review? You’ll see that Eggers does not acknowledge the previous review. And I think if you compare the 1996 and 2006 reviews, you’ll see why many of us got rankled back in the day. It’s this regrettable proclivity to shift an independent viewpoint, one that Eggers refuses to acknowledge, into a positive and crowd-pleasing light. The revisionism is troubling and reminds me of any number of evangelists. (You’re right, I think, to compare it to a cult.) This quality was seen perhaps most egregiously with ZEITOUN, which presented the violent Abdulrahman Zeitoun as hagiographical hero. What is also curious is that this review appeared after DFW contributed an essay to Might Magazine (“Impediments to Passion,” 1996, later collected in BOTH FLESH AND NOT under the title “Back in New Fire”) and that, despite this review, Eggers did somehow persuade DFW to contribute “Mr. Squishy” in McSweeney’s #5 (2000, published under the pseudonym Elizabeth Klemm). So who knows what went down between Eggers and DFW between 1996 and 2000? Some of my sources (aside from Pollack’s brave article) have informed me that Eggers has banished writers outside of his circle (would you expect any less from the author of THE CIRCLE?) or burned them bad. I’m also aware of a few cases where Eggers essentially purchased the silence of critics through “donations.” Nothing tacitly expressed, of course. I do wish people wouldn’t be so afraid to speak out and that Eggers could man up and own his mistakes. Thanks for this; I should’ve paid more attention upfront. Reading the 2006 foreword now, it’s even weirder that Eggers won’t acknowledge his earlier critique, b/c it’s clear that he has some of the same issues he had a decade prior, but he’s been able to place them in a richer context, and to try to inspire readers to soldier on even with said density/difficulty in place. Oddly, I still think the 1996 piece is better written and more forthright, and gives a reader a decent sense of what you’ll find in the novel. The 2006 piece reads like what it is–a chatty blurb for a friend’s book, not a work of serious criticism. Just in case you are curious, I found this review through reddit, I don’t know Dave, and although I’ve read a handful of his books, I didn’t love them all and I don’t have any strong feelings about the guy one way or the other. Just hoping to further the discussion. I’m with walter. This review comes across as surprisingly balanced and honest and on point. infinite jest IS an infuriating book, frantically gesturing towards a feelingness it’s too caught up in its relentless, compulsive clever-cleverness to actually feel. cleverness can be dazzling, but in wallace’s huge book it dazzles fairly infrequently. the short stories work so much better. there’s more vulnerability and love in them. Most folks who read IJ totally miss that it is ALTERNATIVE HISTORY SCIENCE FICTION, a world where Kemp/Limbaugh won the Presidency (rather than Dole/Kemp losing). That is what leads, as Eggers notes, to the Concavity and the Johnny Gentle presidency. This is totally obscure in the novel and took me a long time to puzzle out myself (message boards etc). Well so Eggers’ review just comes right out and says it. This skeleton key unlocks many features of the novel, such as the key of Erdedy’s guilt for having gotten Gentle elected as the idea guy behind his campaign while at the PR firm Viney and Veals, which led to him realizing he could no longer hack his life and so he enters the halfway house to quit the weed habit that had fueled his bizarre creativity. Anyway because this tiny reference in the original novel unlocks SO MUCH of its hidden interpretation, and Eggers puts the reference so front and center in his review, it seems to me that the review acts like a HINT SHEET to those who were going to read the book and be puzzled by it as a result of the review. It’s as if DFW had egged Eggers on. That one clue in that review gives folks a spoiler that honestly is so very buried that this review functions to make the book a LOT more functional for those folks herded into buying it by the review. They are lucky readers if they know about Kemp/Limbaugh up front as most folks reading it now have no idea what I’m talking about. Now, I have proof…. Kemp/Limbaugh is a “thing” in IJ, I’m not making that up! !’ Thank you!!! I just finished the Infinite Jest and I will agree that Eggers is spot on with this review. It took 800 pages before the author started putting the story together. And 100 pages of foot notes that I didn’t read until the end because I wasn’t going to flip back and forth and dig out the information in the footnotes that blathered on and on. This is worse than Thomas Pynchon, whose books I have read every one, and tried to understand, of which I am not quite sure I do. The only thing I feel after reading Pynchon and Wallace is that they both must be on drugs. This review seems honest. But it is disappointing given that it comes from an author who is read frequently. 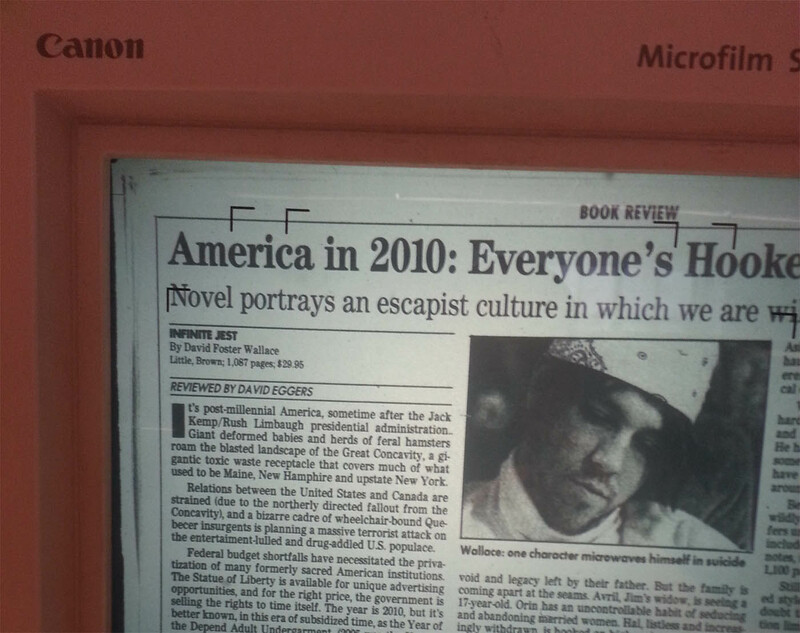 DFW wasn’t trying to write entertaining fiction, given that his final unfinished work was about boredom, I think maybe his intention was to challenge the audience. Yes it is a very convoluted, self indulgent work. But it is very upfront about that, and thus is true. I think that’s all DFW cared to write a 1000 page book for. What’s an endless joke on somebody? And is it an endless joke on the writer, reader, academic, nonacademic? Is the joke on anybody? Or is the title just the longest joke? A joke has to end, or there is no joke. The joke didn’t end? There is no punchline. Whatever Eggers’s personal idiosyncrasies or blatant flaws, this is an honest and truthful review. He gives DFW credit for his brilliance (how could he not) and imaginative zeal as well as for his writing strengths; but his criticisms of this novel and its author as novelist are accurate and devastating. It is a well-rounded assessment of the book and the writer. Nothing to be ashamed of here. People change. My opinions of books change. Maybe his do too?